No sooner had Jordan Spieth been fitted with the most sought after item of apparel in all of golf, the 21-year old Texan singled out last December’s Australian Open success as pivotal to his Masters winning glory. Spieth equalled Tiger Woods’ 72-hole low record in shooting a final round 70 to win by four shots with an 18-hole tally. However it was not until after the new champion’s formal press conference Spieth was made aware had he not bogeyed the last he would have been the first player ever in Masters history to post a 19-under par tally. Despite his genuine surprise there was no such reaction when he was asked the significance that winning the Stonehaven Trophy five months earlier in Sydney played in his maiden Major Championship triumph. Spieth became the first American-born golfer since 1993 when compatriot Brad Faxon was coaxed by good friend Greg Norman to travel to Sydney on what was virtually a holiday and won the Australian Open. Spieth posted a blistering last round 63 in bright but very windy conditions, and on a day when no other player broke 70 on the revamped Australian Club course. The question connecting his Australian Open victory and his triumph around the Georgia golfing gem was put to him directly by Sydney’s own Bernie McGuire. 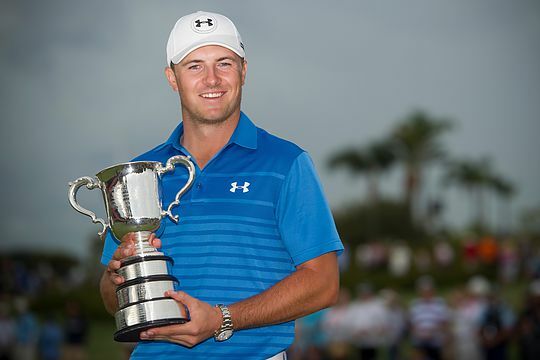 “That (Australian Open win) could arguably be one of the best wins that I’ve ever had,” said Spieth. From winning in Sydney, Spieth crossed the International Date Line and retured to the States where he stormed to success a week later in the Woods hosted Hero World Challenge in Orlando. The young Texan then kick-started 2015 with three top-10s in his first four PGA Tour events before capturing a second PGA Tour title with a play-off victory in the Valspar Championship. Spieth teed-up in the Tour’s ‘Texas Two-Step’ finishing runner-up to fellow Texan Jimmy Walker in the Valero Texas Open before just missing out in a play off for the Masters curtain-raiser in the Shell Houston Open. And despite his last hole bogey there was emotional scenes at the 18th green with Spieth greeted by his parents and brother while also devoting his victory to his beloved 13-year ‘special needs’ sister, Ellie back home in Dallas. Now the 21-year old Spieth is exempt to compete at Augusta for as long as he desires. However Spieth, as he confirmed in San Antonio a fortnight ago, will return to Sydney to defend his Australian Open title later this year. “I fully plan on making the trip back to Australia,” Spieth said of the Australian Open, to be played again at The Australian on November 26-29.